Eco-Babyz: Win some organic yogurt from Stonyfield! Win some organic yogurt from Stonyfield! I love yogurt. Even more so Greek yogurt. 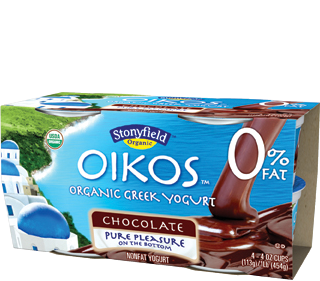 Most of all Stonyfield Oikos Organic Greek Yogurt. I can't get enough, especially of the new chocolate and caramel flavored ones! So good, it feels like I should be eating it hiding from my toddler after she's sleep! But it is actually great for her as well, she tried both and loves the chocolate - of course. At least it is a treat I don't feel guilty giving her, like ice cream loaded with sugar. I forgot all about the little surprise from Stonyfield as I sat at my laptop early in the morning, three month old son in one arm, blogging away. Door bell rings, it's FedEx. Rare, usually all deliveries are UPS. I scramble to open the door. Big box, insulated and refrigerated. I smile. :) This is the cute box hiding inside the big box. You know what, you can win some of your own Stonyfield Oikos on their Facebook page, just share how you indulge! If 50,000 people enter, one person will win a year's supply of organic Oikos! Disclaimer: I was not compensated for this post! I was sent some Stonyfield Organic Oikos to indulge in but was in no way required to share it with you. How could I not? I think everyone deserves some free Oikos! I notice that you said this yogurt is guilt free, as opposed to 'sugar loaded' ice cream. Oikos has 16g of sugar. A typical chocolate ice cream has 16g of sugar. So the reality is that most of these 'diet' yogurts have just as much, if not more sugar than ice cream and other sweet treats. I have to try this flavor, my kids like organic frozen yogurt tubes and that is substitute for ice cream especially winter time.